Sans Soleil is an invented document of the travels of a fictional traveler. This traveler, Sandor Krasna, is given a voice and with this voice he becomes somehow real. This is partly just how fiction works, but the process of constructing memories is also integral to how we understand ourselves, our lives, everything. If I look back at my journals, the feelings that compelled me to write are the ones that construct the narrative of my life, and therefore continue to shape who I am now and the decisions I make. All the other feelings I felt, of which there were no doubt many, have slipped into oblivion. A year or so ago, Errol Morris started a fight with Susan Sontag. 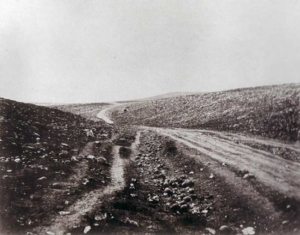 Morris took issue with Sontag’s assertion, in her book on photographs of human suffering, Regarding the Pain of Others, that two pictures taken by Roger Fenton of the Crimean War in 1855 were taken in a particular order. 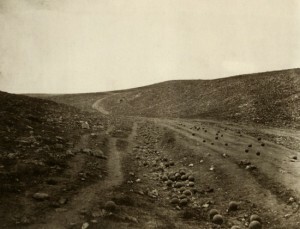 Sontag, discussing the necessity of early war photographers to sometimes stage their images for dramatic effect, assumed that Fenton rearranged cannonballs that were on the side of the road to be scattered across the road for his second, much more famous image. Morris was so upset by Sontag’s assumption that he went to the Crimea to discover the cold, hard facts of the case—and in the end, Sontag was right. But at a certain point, those facts begin to be shaped by the photographs themselves. It is not always possible to find out, as Morris did, which image came first. Sontag made a reasonable assumption, and if Morris had never gone on his obsessive journey most people would have never questioned that she was right. And more importantly, what would the difference be? Do we understand those images better now because we know the irrefutable facts of the case rather than assume them based on the evidence given? The document is most often all we can know. The document shapes our memory, and our knowledge of the potential for documentation shapes our present and future. I make my Facebook profile? My Facebook profile makes me? Things are getting messy. Recently I’ve been working on an experiment. My friend and I have been having a series of fifteen-minute conversations with various people. After we have these conversations, we sit together and remember them. We walk back through what was spoken about, the relationship that was established, and pull out a few sentences, a moment, an impression, and write it down. Looking back at the small pieces of writing this project has produced, I find myself wondering why a tiny, random morsel of information is all we saved from what I thought was something more substantial. But by that point it’s lost, the event itself is gone. We are manufacturing memories. We chose what to remember and once we’ve chosen we can’t change it.